Today I traveled to Detroit through The Detroit Free Press dated January 20, 1964. There I found the bold headlines dealing with the mafia figure Santo Perrone who’s legs were serious injured in a car bombing incident. This includes photos of his car, now in twisted metal. 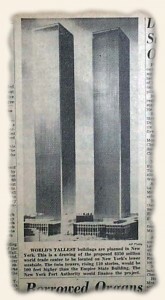 Inside the issue, I also found “World’s Tallest buildings are planned in New York…” This is in reference to the Twin Towers at the World Trade Center and includes the illustration of them as well.